Susan Wiggs focuses on another branch of the wealthy Bellamy family in the eleventh book of her Lakeshore Chronicles. The book opens as the three children of Alice and Trevor Bellamy gather in New Zealand to spread the ashes of their father on the mountain where he perished when he was caught in an avalanche while skiing. Their mother survived, but her injuries were severe. 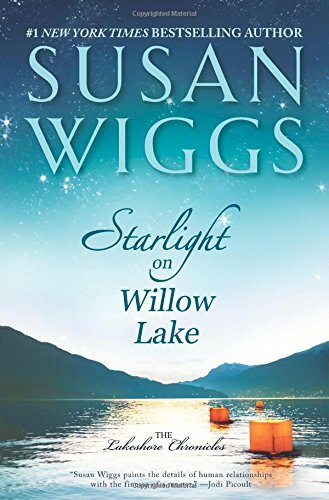 The woman who traveled the world and joined her husband in his athletic pursuits is now a paraplegic who rarely leaves the luxurious home on Willow Lake outside Avalon, New York, that her older son Mason has had outfitted for her needs. Burdened with the knowledge of family secrets as a teenager, Mason Bellamy responded by preserving an emotional distance from both his parents. That distance colors his memories of his father and his relationship with his mother. A successful financier, Mason spends exorbitant sums of money to purchase the Willow Lake estate, install every convenience that will make his mother’s restricted life easier, and pay the salaries of a large staff to serve her, but he is uncomfortable spending time with her. When Adam, who has moved into an apartment over the boathouse in order to assume the major responsibility for Alice’s care, has to be away for several months of training in arson investigation at the same time that a long-awaited opportunity in Paris opens up for Ivy, their younger sister, Mason is forced to take a more direct role in his mother’s care. Embittered and angry, Alice has driven away every home health care provider hired to care for her. Mason’s first task is to find someone who can deal with his difficult mother. He reluctantly remains at Willow Lake to interview applicants. The most promising of the group is Faith McCallum. Mason’s plan is to hire her, stay long enough to make sure she was the right choice, and return ASAP to his life in NYC. A job that provides a decent salary and living quarters is just what Faith, a widow with two daughters, needs. Debt from her late husband’s medical expenses and the cost of her younger daughter’s care have stretched Faith’s resources so thin that she and the girls are at the point of becoming homeless. An unexpected crisis showcases Faith’s cool head as well as her medical skills and convinces Mason that she is the perfect caretaker for his mother. So Faith and the girls join the household. Faith’s blend of challenge and compassion and the honesty and liveliness of her daughters soon have Alice involved in life again. Grateful for the job, Faith tries to ignore the attraction that simmers between her and Mason. Not only is he way out of her class, but he also has a fiancée. Mason had not counted on the chemistry and connection that he finds with Faith nor the appeal of seventeen-year-old Cara’s intelligence and toughness and eight-year-old Ruby’s charm and courage. These feelings are threatening Mason’s carefully constructed reserve and even reshaping his relationship with his mother. But Faith’s memories of a husband she loved and lost and her awareness of the social chasm that separates her from Mason make her wary. Can these two let go of their fears and accept that the love they were not looking for may offer all their hearts desire? Wiggs delivers another Lakeshore Chronicles book peopled with engaging characters dealing with the unexpected turns their lives take. I especially enjoyed watching the relationship between Mason and Faith develop gradually. Faith is a wonderful heroine, committed to her profession, devoted to her daughters, and strong in significant ways while still human and vulnerable. I was a bit slower to embrace Mason because I have ODed on the emotionally distant hero, but his discovery that his adored father was deeply flawed provided a credible reason for the man Mason became. And I loved watching Faith and her girls melt his reserve. The romance is central here, but family relationships are also important—and they are complex and compelling. Wiggs excels at reminding her readers that each character, even the minor ones, has a story, and she does so without distracting the reader from the central tale. 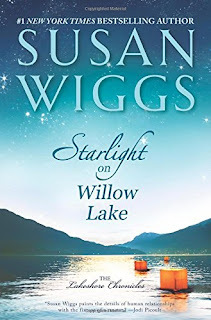 Although this book is part of a long-running series and characters from earlier books make brief appearances, Starlight on Willow Lake works well as a standalone. If you like contemporary romance rich in contexts and centered on a relationship that is at least as much about the dreams and doubts and scars and struggles of the two people involved as about fire in the blood and the loins, I definitely recommend this book. I really enjoyed this series - I'll be reading this one to catch up.